Chelmsford, MA, a lovely town with rich history and lots to offer to its residents. Many homes are ready for new siding in the local area. 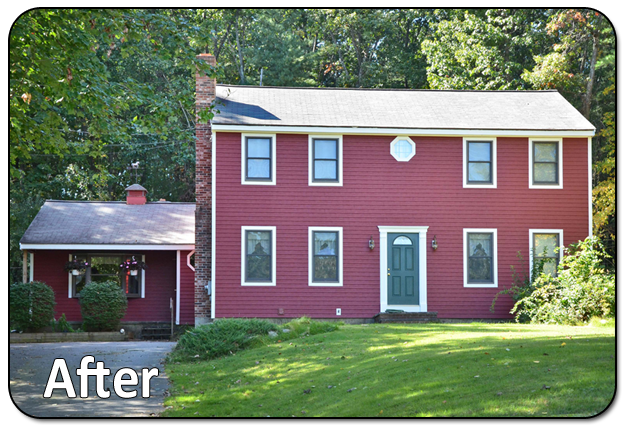 Recently we had a wonderful couple who contacted us to replace their home's siding with Everlast Composite siding and the results were spectacular! This family oringinally was looking into fiber cement siding to replace the rotted Masonite siding that was on their home. 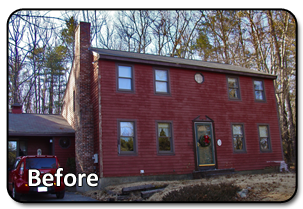 They continued to search for siding alternatives and found Everlast and after reading the facts versus fiber cement, they quickly chose Everlast Composite siding. After deciding to choose Everlast, they deciding that they wanted to keep the original color of their home and naturally they chose our beautiful Cabernet Red, 4.5 inch clapboard. We removed all existing siding, trim and frames. We then installed new 4-inch corner boards, new PVC window and door frames and before installing the siding, wrapped the home in Everwrap. The end results of the home are stunning and the homeowners couldn't have been happier.